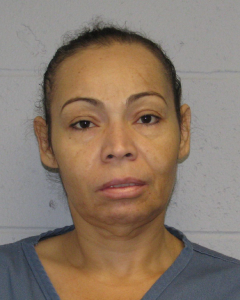 The Union County Prosecutor’s Office arrested an Elizabeth woman yesterday afternoon and charged her with multiple counts of theft by deception after an investigation revealed that she was defrauding immigrants in the city, announced Union County First Assistant Prosecutor Albert Cernadas, Jr.
Mariza Chavez DOB: 6/19/1967 was charged with multiple counts of 3rd Degree Theft by Deception and 3rd Degree Failure to Make Required Disposition of Property as well as 4th Degree Unauthorized Practice of Law. Her bail was set at $30,000 by Union County Superior Court Judge Robert Mega. According to an investigation by the Prosecutor’s Special Prosecution Unit, Chavez represented herself as an attorney to clients and told them that she would file documents with the United States Citizenship and Immigration Service on their behalf, said Cernadas. She charged anywhere from $80 to $6,000 for the service, which she was not trained to perform. She would submit applications on client’s behalf that were incomplete, improperly filled out, or failed to contain the required fee. When the applications were eventually rejected and returned to her with a refund of the money submitted, Chavez pocketed the refunded funds. Chavez has operated a group called Worldwide Foundation to Rescue the Immigrant at various addresses in Elizabeth for at least the last five years. Her group, also know as FMRI operated out of a former church rectory in Elizabeth at 1100 East Jersey Street. Previously she operated a similar organization at 55 Jefferson Avenue in Elizabeth as well as in New York. During her meetings with victims, Chavez claimed to be an attorney. However, she is not licensed to practice law. When various victims called her office to inquire about the status of their application, Chavez would create various explanations to cover the fact that applications were rejected and that the money had been refunded to her. The thefts came to light after an attorney for three victims contacted the Prosecutor’s Office in September 2011. An investigation was immediately launched and to date investigators have interviewed approximately 10 potential victims, and reviewed various immigration applications related to the case. This remains an active investigation. Anyone with information is urged to contact Det. Johnny Ho of the Union County Prosecutor’s Office at (908) 527-4551.